SEPANG (MALAYSIA) - A defiant Sebastian Vettel vowed Thursday not to change the way he drives despite his first-lap exit in Singapore as he prepares for Sunday's last-ever Malaysian Grand Prix. Vettel's Ferrari started from pole but was involved in a crash at the start that also took out team-mate Kimi Raikkonen and Red Bull's Max Verstappen on a rain-soaked Marina Bay Circuit. It allowed Lewis Hamilton, who avoided the carnage to win from fifth on the grid, to extend his championship lead from a slender three points to 28. "I'm not too fussed about the amount of points," Vettel told reporters at the Sepang International Circuit. "Obviously it's never good to be behind, we'd like to be in front, but we're not, so we've got to take it from there. "Overall it doesn't change anything for how we tackle the last six races." Vettel was exonerated of blame for the Singapore crash by stewards, but many observers felt the German four-time world champion was at fault as he had forced Verstappen towards Raikkonen. But Vettel said that he hadn't given the crash much thought since because it was just "part of racing". "I think it would have been more difficult if I had lost the car somewhere in the race, then it's obviously different," he said. "The lights went off, we did our start. Everyone was trying to do his start and with the way it happened it ended up really bad for all of us. There's not much you can do. I think it's part of racing. "It certainly didn't help Lewis scored a lot of points but that's the way it goes. What's done is done. "It's not the first time I'm in the situation like this and probably will not be the last time -- not that I'm hoping for it to happen again." Raikkonen said there was no point in dwelling on what happened and that Ferrari could still take plenty of positives from Singapore. "In Singapore Sebastian was first and I was fourth in qualifying so if you compare it with Mercedes we were better," Raikkonen said. "Then we basically didn't race." Hamilton qualified only fifth and team-mate Valtteri Bottas sixth on the grid in Singapore. Verstappen, who was sandwiched between the two Ferraris, was reluctant to talk about the crash. "It happened. You can't change it. We try again," said Verstappen. 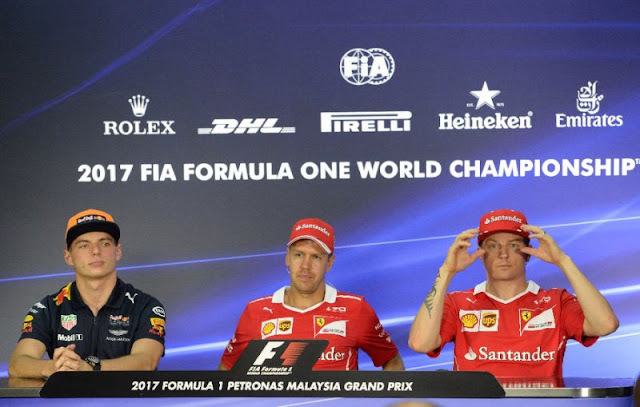 Sunday will see the final running of the Sepang race after the Malaysian government announced it would not continue to fund the $67 million annual cost of staging the grand prix. Raikkonen recorded his first victory at the circuit in 2003 but in typically unsentimental fashion said he wasn't upset to see the race disappear from the calendar. "To be honest I don't know if we're going to miss it," the Finn told reporters. "It's a nice circuit," he continued, "but the only thing you see is the airport, the hotel next to the airport and the circuit. You can choose from that what you're going to miss, or not." A defiant Sebastian Vettel vowed Thursday not to change the way he drives despite his first-lap exit in Singapore as he prepares for Sunday's last-ever Malaysian Grand Prix.